With SharePoint Resource Management web part, you can easily check the workload of your employees and utilization of material resources and, if needed, immediately make the necessary changes. SharePoint Resource Management Web Part provides SharePoint 2016, 2013, 2010, and 2007 users with a variety of tools for resource management and utilization tracking. Unlike SharePoint Gantt Chart, with this component you can easily check the workload of your employees and utilization of material resources and, if needed, immediately make the necessary changes. Resource Management Gantt allows you to manage effectively both resources and materials. You can use the web part for project management resource utilization and control the workload of your project resources. SharePoint Resource Management web part allows users to view data from SharePoint list of any type, so you can conveniently display and manage project and material resources in chart view. SharePoint Resource Management supports multiple data-sources and, also, can display custom columns. The web part is designed for SharePoint 2007, 2010, 2013, 2016, and supports Windows and Mac OS. 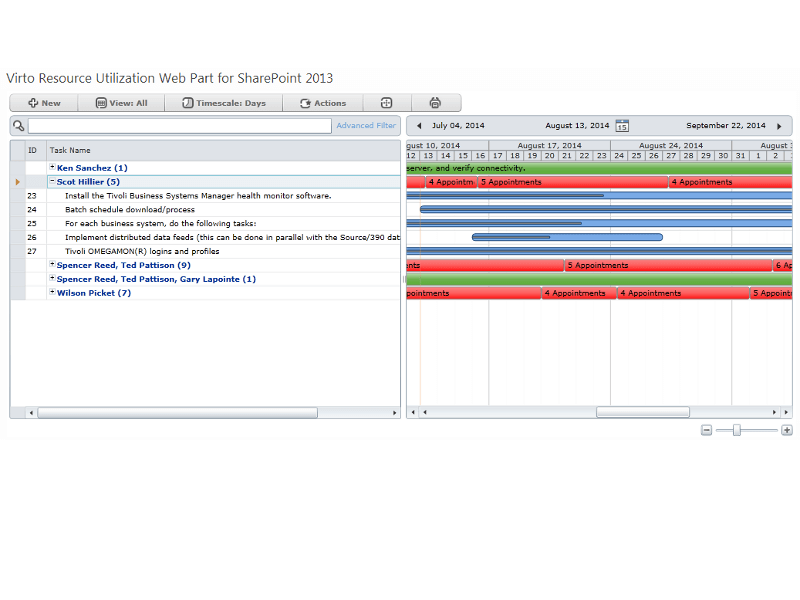 Using SharePoint Resource Management web part, you can easily resize and drag & drop tasks to change duration or dates. 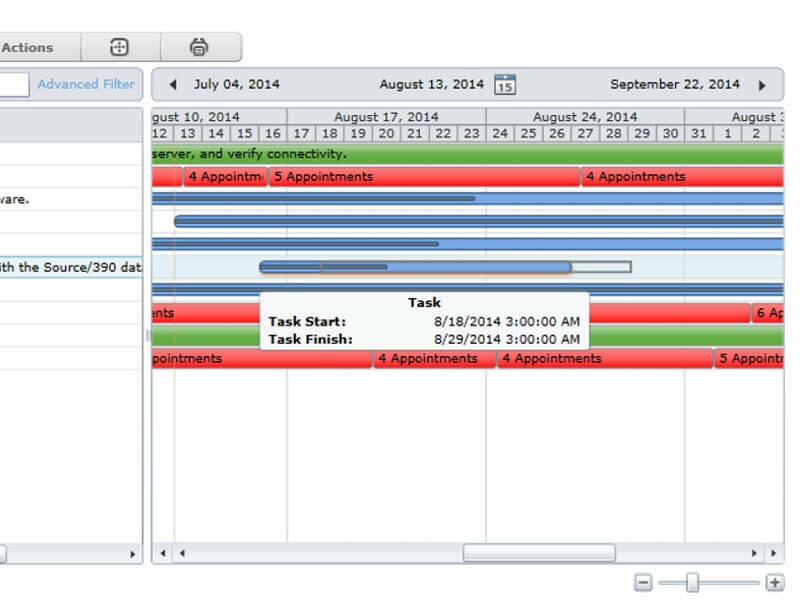 You can create, view, edit or delete tasks right in the Gantt view. You can select timescale: Hours, Quarter Day, Day, Week, Month, Quarter, Half year. SharePoint Resource Management web part provides the yellow-green-red level controlling and, also, you can conveniently use Find and Filter Bar with interactive filters. With SharePoint Resource Management Web Part, you can use full screen mode, zoom and print the table in distinct views (All, Table only, chart only, current view). Also, you can set the web part to Read Only mode. SharePoint Resource Management web part is an interactive Silverlight-based web part that provides SharePoint users with a variety of tools for resource management and utilization tracking in Gantt view. With this component, you can easily check the workload of your employees and utilization of material resources and, if needed, immediately make the necessary changes. Virto SharePoint Resource Management web part is fully compatible with SharePoint 2007, SharePoint 2010, SharePoint 2013, and SharePoint 2016. SharePoint Resource Management allows you to manage both resources and materials. You can use the SharePoint Resource Management web part for effective project management, resource utilization, and workload control of your project resources. You can use any SharePoint list as a data source for the component, and then track utilization of the resources in chart view. Having all the resources and their assigned tasks in a single chart, you can easily view all the workload information and tasks details as well as edit, create and reassign tasks in order to make sure that your resources are utilized efficiently. Alternatively, SharePoint Resource Management web part can be used for tracking and managing utilization of material resources such as meeting rooms. With SharePoint Resource Management web part, you can easily schedule meetings in way that guarantees they do not overlap, and the rooms do not stay empty. It is enough to select one or several meeting rooms as the web part data source and start assigning them as meeting resources. Additional filtering and sorting options, table and Gantt views, drag-and-drop move and resize features, as well as green-yellow-red workload color coding make the work with the component simple, intuitive and convenient. It is a part of Virto SharePoint Collaboration Suite and Virto ONE License. Manage SharePoint projects SharePoint Resource Management web part allows users to view and manage SharePoint projects and material resources. Color-coded level control SharePoint Resource Management web part uses yellow-green-red level controlling. Use multiple data-sources SharePoint Resource Management web part supports multiple data-sources. SharePoint task management Using SharePoint Resource Management web part, you can easily resize and drag&drop tasks to change dates and duration. Multiple timescales Hours, Quarter Day, Day, Week, Third of month, Month, Quarter, Half year. Different task actions Create, View, Edit and Delete Task actions. Filters You can use Find and Filter Bar with interactive filters. Print a chart view You can print: all, table only, chart only, current view. Read Only mode You can switch SharePoint Resource Management web part to the Read Only mode. Additional columns SharePoint Resource Management web part can display custom columns. If you're looking for a great SharePoint resource planning solution, you should pay attention to this tool by Virto. It allows you to manage resources in Gantt Chart view with a user-friendly interface. Your resource management SharePoint process will never be the same! 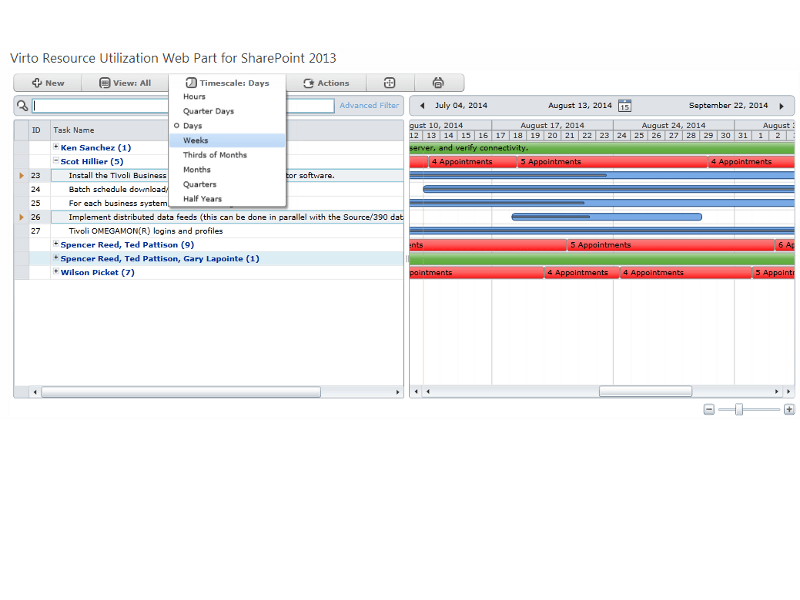 I really love this resource planning sharepoint tool! It's very easy-to-use and effective. Now my sharepoint resource management process is much effective. Very easy to use and intuitive. It is not over complicated but has a lot of powerful features if you wish to use them. I had been looking for a simple SharePoint resource management software to help me in my new job and this is perfect. Easy tool for SharePoint resource management, highly recommended.